Use your Chislehurst Society membership to benefit from the rewards listed below by our Chislehurst businesses! The Chislehurst Society has teamed up with a number of Chislehurst businesses to provide a reward scheme that is exclusive to Chislehurst Society members. All you have to do is show your current Chislehurst Society membership card to the business in question at the time of making the purchase or order and you will receive the benefit shown. The Chislehurst Society supports independent businesses and here’s why. Local businesses …. Plus other Chislehurst businesses joining all the time. Disclaimer: Inclusion of a business in The Chislehurst Society Reward Scheme does not necessarily constitute or imply its endorsement or recommendation by The Chislehurst Society or its Trustees. In no event, shall the Chislehurst Society be liable for any direct, indirect, consequential or incidental damages, or any damages whatsoever in conjunction with the use of The Chislehurst Society Reward Scheme. 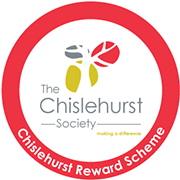 The Chislehurst Society and the participants in the Reward Scheme reserve the right to make additions, deletions or modifications to the Scheme and the Rewards at any time without prior notice.